YANGON — Former military dictator U Than Shwe took a rare break from private life on Wednesday to meet with ethnic Pa-O leaders at his home in Naypyitaw, where he urged them to abandon their old faith in karma and devote themselves to building roads and educating their children. 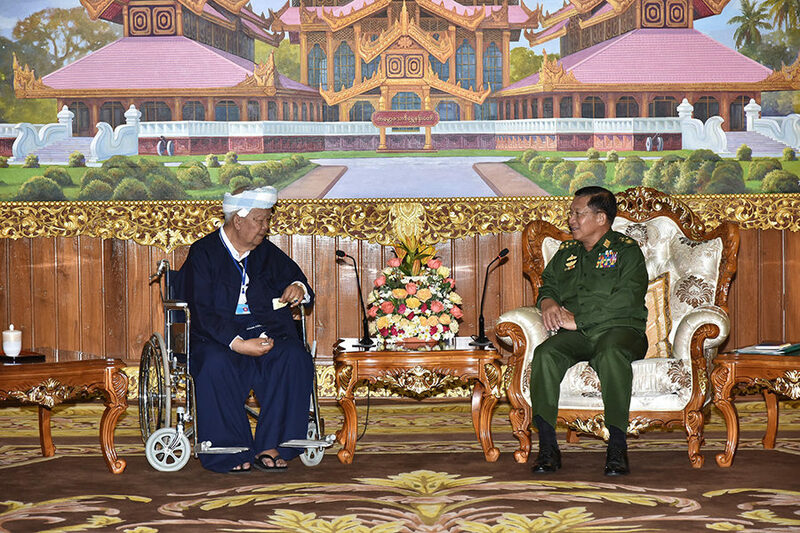 The 83-year-old ex-junta leader met with a delegation led by U Aung Kham Hti, the patron and former chairman of the Pa-O National Organization (PNO). “The Pa-O rely only on [good karma from] the deeds of their past lives. They hardly think about how to make the most of what they have in the present. Put your efforts into the present. Don’t believe too much in karma. Nothing will come of it,” said Khun Thein Pe, an ethnic Pa-O Union lawmaker who joined the meeting, summarizing what U Than Shwe told them. “He told us the Pa-O need to work hard all the time. It is a good time to work on development. Nothing will happen if you trust karma,” he added. Khun Thein Pe said the former dictator said the Pa-O should focus on improving roads in their self-administered zone in southern Shan State so they could better organize the community and foster unity. The lawmaker said he also advised them to form a foundation devoted to improving the education of Pa-O students. “He told us this was the only way the Pa-O could get a better education in their region,” Khun Thein Pe said. “He especially told us to continue to maintain peace in the region because it already has peace,” he added. Once counted among Myanmar’s many ethnic armed groups, the PNO signed a ceasefire with the military regime in 1991, transforming itself into a political party with a militia that manages security in the Pa-O self-administered zone. Its leaders remain close to the military and the military-backed Union Solidarity and Development Party, and are accused by local politicians and activists of forcing residents to the self-administered zone to join pro-military rallies. PNO leaders have made a habit of visiting U Than Shwe once a year, paying him their respects and listening to his counsel on ways to develop their community. On their trip to Naypyitaw, the Pa-O delegation also met Wednesday with Myanmar military chief Senior General Min Aung Hlaing. Khun Thein Pe said the commander-in-chief told them that the Pa-O needed to act in the interests of the country and that they could only do so by improving their education system first.